October 2017 - My z5 has just restarted itself and now the wifi won't turn on at all. Tried all simple fixes to no avail. Are Sony trying to phase this phone out or something? Lol. I have the same issue, and this is how I solved it. WiFi turns "on", but it does not see any networks. 1. Go to Settings -> About Phone -> Support. It takes a while, but it passes. 3. Then reboot. My Wi-Fi now (often) starts as it should. Please note that the problems comes back from time to time. This is a work around, not a fix. I have the same issue and this is not the only issue with the Xperia phones. This is my second z5 as they are bad!!! And on top f Sony being a bad phone they have the worst service ever!!! Stop making phones and robbing people! While I understand your frustration, but using vulgar words and curses won't help your case. Keep it clean, please. Tried your trick, it helped. Hi, i was also facing the same problem in my xperia z5 premium dual, i tried everything like reset,hard reset, software repair by sony pc software and flashtool to fix this problem but nothing works. When i become tired form every ways finally i fixed it by simple way. hey that doesn't work. any other solutions? 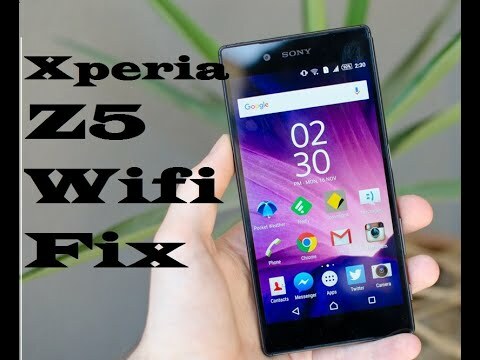 It worked on my Sony Xperia Z5.